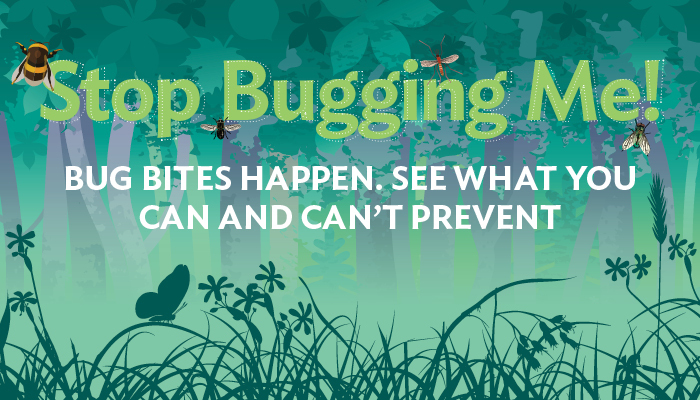 You try your best to prevent them, but bug bites happen. Between the stings, swelling and itching, it can be hard to know which type of bug is to blame and how to treat symptoms. Thomas Serbousek, MD, UnityPoint Health, helps identify common bug bites and offers advice on how to prevent them. Bed bug bites. Look for multiple bite marks clustered together on the face, neck, arms, hands or any other body parts, especially after sleeping. The bites resemble mosquito bites and are often itchy and appear slightly swollen and red. Some people have no reaction to bed bug and won’t notice bite marks. Bed bug bites don’t always show up immediately, and can take up to two weeks to develop in some people. Bed bugs don’t spread disease. Mosquito bites. A slightly swollen and red area that may itch and be irritating, which usually appears soon after being bitten. Mosquitos spread disease including Zika virus, West Nile Virus, malaria, Chikungunya virus and dengue. Tick bites. You may notice a tick bite, because the tick is still attached. If it has dropped off, you might see a red spot or rash near the bite, which might itch and burn. However, many tick bites don’t have symptoms. If you notice more severe, flu-like symptoms call your doctor. Ticks carry Lyme disease. Chiggers bites. These bites usually show up in clusters around the waste or lower legs, but they can bite anywhere on the body. You might notice red skin with bumps, blister or a hive-like rash. Chiggers aren’t dangerous and don’t spread disease. “As the saying goes, an ounce of prevention is worth a pound of cure. While some bug bites can’t really be prevented, there are proven ways to guard off others,” Dr. Serbousek says. Using insect repellent can be an effective prevention method, but only for certain types of bugs. Non-preventable. Unfortunately, repellents aren’t effective against stinging insects, such as bees, wasps, hornets or spiders. One really can’t prevent these, other than staying away from areas of known infestation. Preventable. Repellents are extremely useful in keeping mosquitoes, biting flies, gnats, fleas, chiggers and ticks away. DEET-based repellents provide the best protection for bug bites that can be prevented. Wristbands containing repellent are not effective, regardless of the repellent type used. For some bugs, like ticks and gnats, Dr. Serbousek says other types of protection and/or repellents are necessary. Lightly cover skin. When using DEET-based repellents, use just enough to lightly cover, but not saturate, your skin. If you’re using with sunscreen, apply the sunscreen before the bug spray. Frequent reapplication of repellent isn’t necessary. Don’t apply under clothing. Apply insect repellent to exposed skin, clothing or both, but not under clothing. Wash your hands. Clean your hands after applying repellent, and don’t apply it to the hands of small children, as they will end up rubbing their eyes. Not for everyone. Children younger than 2 months of age should not use repellents with DEET. But, repellents with 10-30 percent of DEET appear to be safe for children over the age of 2 months, pregnant women and lactating mothers. While many home remedies for bug bites exist, Dr. Serbousek recommends two types of at-home symptom relief. “To relieve symptoms for stings and bites, use cold compresses and/or over-the-counter cortisone cream. If this doesn’t provide enough relief, visit your primary care provider, who could possibly prescribe a prescription cream or ointment. If you believe your bug bite is infected, you should also seek care,” Dr. Serbousek says. Did you know you can receive bug bite treatment from the comfort of your home? UnityPoint Health Virtual Care offers patients a convenient alternative for care when they can’t get to their doctor or an urgent care clinic. Registration is easy and only takes a few minutes. Or, download the UnityPoint Health Virtual Care app in the App Store or Google Play.